Fast and easy Outlook address book contacts. Crowdsourced CRM data quality management. 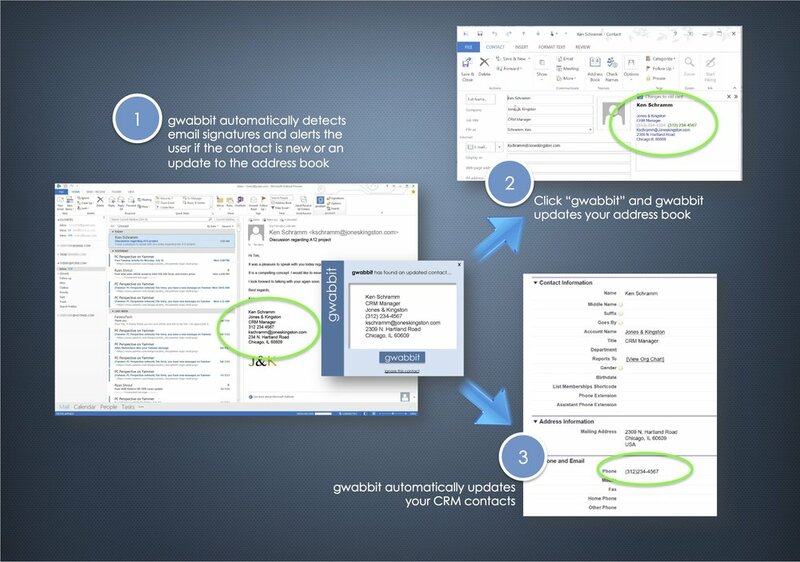 gwabbit Outlook automatically identifies new and updated email signature contacts and alerts the user. Simply click "gwabbit" to update your address book. It's that easy. Watch gwabbit Outlook in action! This 1-1/2 minute video, "The Blue g," shows just how fast and easy it is to capture and update email signature contacts using gwabbit Outlook. gwabbit Outlook offers an alternative to the traditional centralized data quality management model. While updating their address books, professionals and assistants are simultaneously crowdsourcing new and updated contacts to the enterprise CRM, as well as gwabbit ERM reports.